There has been a rise in popularity of commercial drones over the past few years. As many as 1 million unmanned aerial vehicles (UAVs) were expected to be sold during the 2015 holiday season, according to the US Federal Aviation Authority. Companies such as Amazon, Google X, Lufthansa and DHL are using drones for commercial purposes such as aerial photography and surveillance, as well as agricultural operations and delivering parcels and food. But drones are more than toys or delivery solutions for the last mile. The technology already exists to allow them to bridge larger distances and carry heavier loads. The fundamental technology of today’s commercial drones was developed from remote-controlled aircraft, which were widely available in the 1970s. Japan has been using some version of drones in its agriculture industry since the 1980s. It is actually somewhat surprising that other parts of the world have only recently picked up on their usefulness. The development of new applications, such as cameras that capture and measure data using the telecommunications infrastructure, provided the necessary drive to advance the commercial agenda for drones. There is considerable opportunity to expand the scope of drone use into agriculture, energy, government, and other sectors in the future. 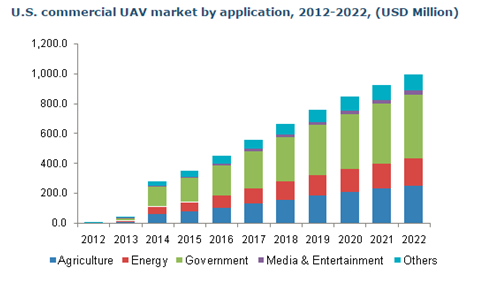 Growth projections from Grand View Research, a US-based consulting firm, show an increase of the US UAV market from US$ 30 million in 2013 to around $1 billion by 2022. However, the technology has its limitations, particularly for larger cargo missions. The performance limit of current commercial drones only allows about one hour of airtime, with no more than 2 kilogram payloads and a maximum range of 20 kilometers. While many technologies in aviation stem from defence applications, this is one case where the commercial sector has not fully adopted state-of-the-art technology. In 1989, military UAVs with GPS navigation were already capable of autonomous 48-hour missions. Today’s military drones are able to fly further than 2,100 miles while carrying payloads of 4,500 pounds. But operating costs provide a challenge to converting the technology to civil application. One promising example of converting a drone from military to everyday use is an autonomous helicopter built by Lockheed Martin. It has been deployed in Afghanistan for three years, with the ability to deliver cargo with a range of 400km and carry loads of up to 6,000 pounds. The company is looking at using the craft for fire-fighting or carrying heavier payloads such as logs to remote or dangerous areas. Operating cost are still high, but this could be the next step in civil cargo operations. In 2013, BAE Systems successfully tested the autonomous operation of a small Jetstream 31 aircraft, controlling a 500-mile-long flight from Lancashire in northern England to Inverness in Scotland from the ground. These technologies could deliver cargo loads in mountainous regions in South America or Eurasia, overcome long stretches of thick tropical rainforest in Africa, and connect thousands of islands in South-East Asia. The benefit of UAVs reaches far beyond the first and last mile. Despite the current challenges of rewriting the worldwide regulatory frameworks and developing new and effective infrastructure platforms (which might take years rather than months), the future of commercial drones for civilian applications has the potential to go far beyond small, robotic flying machines that deliver pizza to our doorsteps. Overcoming natural obstacles and rough terrain over long distances with unmanned aerial systems in a safe and secure environment, and without endangering human beings and pilots, is the next frontier to tackle.